January is here and many of us are back at work today. Feeling tired and overstretched after the holidays? Think twice before reaching for sugary snack or too many cups of coffee to help you get through the day. Too much caffeine and sugar make you more tired and wired. Eat protein-rich breakfast for example oatmeal + mix of seeds + blueberries or scrambled eggs + spinach. These balance your blood sugar, keeping you energised longer. Go for a walk after lunch. Exercising improves your mood & reduces stress as well as can help with digestion. Sleep more. A study suggests that getting one extra hour of sleep each night can boost energy levels as well as increase your mood. Many of us don’t even realise that we are keeping ourselves going with caffeine. According to the studies, over 2.25 billion cups of coffee are consumed in the world every day. Finns are one of the top coffee drinkers in the world, downing whopping 8-9 cups per day! I used to be hooked on black ‘builders’ tea. I ‘needed’ 5-6 big cups per day to give me a quick pick me up & keep me going. Only when I quit black tea & replaced with herbal teas, I realised how much better I felt. Caffeine can inhibit mineral absorption such as B-vitamins & iron. Start by doing a caffeine-check - how you do start your morning? Do you ‘need’ a cup of coffee first thing in the morning, mid-morning and mid-afternoon? What would your energy be like without caffeine? It’s usually fine to drink 1-2 per day (depending on a person) but make sure you also drink plenty water and some herbal teas. These will keep you hydrated. The media has reported of a record number of people hit with the flu. Around 4 million people in England has been reported suffering from flu this year, the worst flu season in seven years. (BBC, 18 January 2018). Here are some tips on how to boost your immune system naturally to prevent the flu or provide relief during the flu. 1. Drink plenty fluids. Drink plenty fluids. In 2003 research (Dr. D. Lewis) found that people drinking just 3 glasses of water a day were 5 times more likely to get a stuffy nose or a sore throat than those who drank 8 glasses. Drinking plenty water helps to keep the mucus membranes moist and trap bugs. 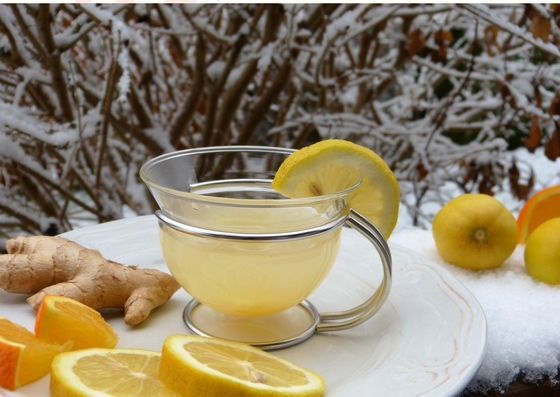 Drink water, herbal teas such as ginger and lemon tea. 2. Eat plenty fresh vegetables. Although you may not have much of an appetite, make sure you eat vegetables daily. Eat easily digestible foods such as soups or sip on bone broth to boost your nutrient intake. 3. Eat vitamin C-rich foods. Oranges, mandarins, peppers, kiwi, berries. 4. Use face steam. I use Olbas oil (eucalyptus oil) before bedtime. Boil 2 cups of water and add few drops of the oil. It helps to open sinuses and help with congestion. 5. Get plenty rest. Sleep helps to keep the immune system healthy and is vital to the body’s ability to fight off infections. I love chickpeas and have been obsessing about these little gems since I was pregnant with my first daughter. Chickpeas are versatile and I use them when making hummus, in stews and pasta sauces and salads. Chickpeas are good source of protein and just one cup (200g) contains 39 grams of protein! They also contain fibre which is good for gut health, helps to balance blood sugar and are good for health health. This recipe is so easy and gives a spicy twist to my usual chickpea salad. Preheat oven to 180C. Drain and rinse the chickpeas and put in a bowl. Add spices and tomatoes. Mix well. Put on oven tray and roast about 35 minutes. Rip some salad leaves to your plate and pour chickpeas and tomatoes on top. I love serving this with dollop of hummus. You could also add some sliced avocado. The berry season is at full swing here in Finland. You can pick your own blueberries from the forest or from raspberries from bushes or buy a variety of berries from the markets. Blueberries are antioxidant powerhouses containing vitamin K, vitamin C, manganese and fibre and raspberries are great source of vitamin C, fibre and manganese. Perfect for a sweet tooth! This summer berry pie is easy to make and tastes heavenly! Melt the butter in a pan. Mix baking powder with flour. Preheat oven to 200C. Whip butter and eggs together. Once foamy add the honey. Mix the mixture with the flour. Mix in and pour into a pie dish. Drop in the berries and bake for 30 minutes.